Pyloric stenosis classically presents in the first two months of life, but not often at birth. The classic presentation includes projectile vomiting and an infant who remains hungry after vomiting. Early evaluation with a pyloric ultrasound and surgical management prior to severe electrolyte disturbance (hypochloremic metabolic alkalosis) is essential. Associated symptoms due to vomiting can include dehydration, abdominal pain, poor weight gain, and hunger. Stabilize infant – depending on the duration of vomiting, electrolyte disturbances and severe dehydration are possible. Stabilization with IV fluids is essential prior to surgery. Abdominal ultrasound – an abdominal ultrasound is diagnostic. 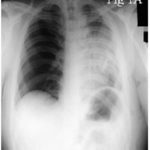 The diagnosis of pyloric stenosis includes that classic presentation and radiographic studies. The classic presentation is often a 2-6 week infant with projectile vomiting and persistent hunger. Physical exam – a careful physical exam in a cooperative infant can often lead to the diagnosis with the detection of the classic “olive” in the pyloric region. Ultrasound – accuracy is excellent and is positive when the muscle thickness is 3-4 mm and the muscle length is 15-19 mm. Upper GI – an upper GI will often suggest pyloric stenosis with an elongated pyloric canal with a “bird’s beak” ending resulting in obstruction. Gastroesophageal reflux (GER) – infants often show signs of GER with physiologic regurgitation in the first few months of life. Reflux can often initiate more forceful “projectile” vomiting. Anatomic abnormalities – anatomic abnormalities such as intestinal atresias, webs, and malrotation also present with persistent vomiting which can be forceful and projectile. If an abdominal ultrasound is not diagnostic, an upper GI study is often necessary to rule out anatomic abnormalities, and can also suggest pyloric stenosis. Treatment of choice remains surgical pyloromyotomy which is performed laparoscopically and has excellent results. Endoscopic balloon dilation has been performed, but is reserved for children in whom a surgical approach is not possible. Long-term outcome is excellent following surgical correction. The pathophysiology of pyloric stenosis remains unknown. The circular layers of muscle at the pylorus hypertrophy leading to a narrowing of the pyloric outlet. However, the cause of the hypertrophy is unknown. Pyloric stenosis is often found in a familial pattern with as much as a 20-fold increase in siblings. It is more common in males by an approximate 5:1 ratio and more common in first-born children. Children of parents with pyloric stenosis are at increased risk of developing pyloric stenosis than children without a family history.